On February 6, 2018, it was announced that Tronc would sell the Los Angeles Times and San-Diego Union Tribune to billionaire doctor and investor Patrick Soon-Shiong. Los Angeles magazine spoke with Soon-Shiong for the April, 2013 issue. Los Angeles has a rep for having tremendous riches and a paucity of rich people who give. But in fact, the city ranks second nationally in terms of philanthropic giving. Patrick Soon-Shiong is no doubt one reason for that statistic. The wealthiest person in the city, he’s put together a philanthropic enterprise that has pledged hundreds of millions to local hospitals, and he plans to give out $1 billion more. Born in South Africa, Soon-Shiong moved to L.A. in 1979 and joined the surgical residency program at UCLA, where he performed the school’s first pancreatic transplant operation. That experience led him to pioneer a new method for treating diabetes and later to invent the cancer drug Abraxane—one of dozens of patents to his name. Along the way he spun off two pharmaceutical companies. 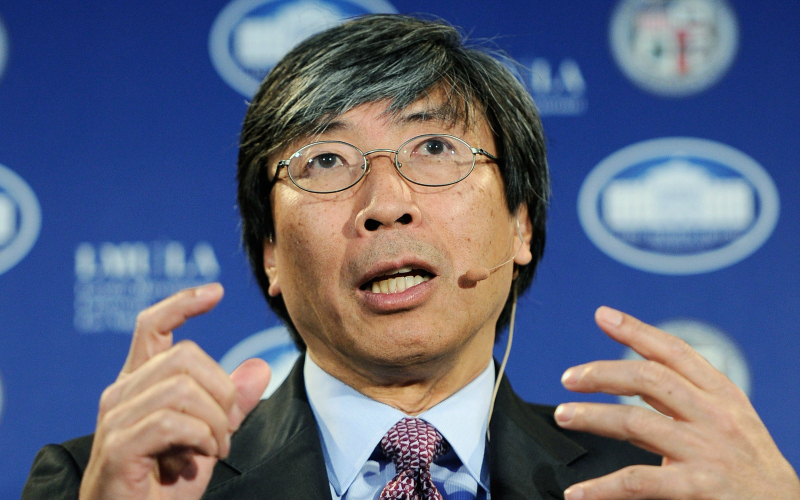 More recently Soon-Shiong, who’s 60, has also branched out beyond medicine. He bought Magic Johnson’s share in the Lakers (you can often spot him courtside at Staples Center) and is part of a group bidding for Philip Anschutz’s AEG, the sports and entertainment colossus that is aiming to crown L.A. Live with an NFL stadium. Soon-Shiong sat down in the Santa Monica showroom of Jakks Pacific, the toy company in which he owns a stake, to discuss giving—as well as what’s ailing L.A.
You’ve established a family foundation and several other nonprofits, all of which are involved in promoting health and well-being. You also have NantWorks, a for-profit company that is working on advanced health care technology. To your way of thinking, what’s the difference between the philanthropy and the business? We’re all about making an impactful change in people’s lives in ways that we can touch and feel right now. Whether that is exercised through our philanthropic mission or through our entrepreneurial, for-profit mission—in a funny way I’m really indifferent. All I want is to get it done. And that sort of speaks to what I’m doing with our philanthropy. We’re not about putting our names on buildings. We’re not about shouting from rooftops about what we’re doing. We’re also not about a handout; we’re about a hand-in, which is a different concept. We want to figure out how we can change people’s lives in real time. You grew up in South Africa under apartheid. Do you see any parallels between that system and American health care? Very much so. In South Africa being Chinese meant I wasn’t white and I wasn’t black. I trained in Baragwanath Hospital, the largest black hospital in South Africa. That was around 1976, the time of the Soweto Uprising, when police fired on children and students who were protesting. I was part of the group of interns who volunteered to treat them. After that, I continued my training in the clinics in the townships, where I treated kids with tuberculosis. I was injecting them with this drug called streptomycin. I realized that I had no idea what I was doing for or to these kids. There were no X rays, no tests. No ability to actually watch the progress or do anything. I said, “I don’t know if I’m helping or hurting these kids.” That’s when I had the vision of what I wanted to do: leave South Africa and identify the technologies that would allow me to treat these kids as if they were at the Mayo Clinic. But do you see a similar inequity in the American system? If you look at the health care system in the U.S., 60 to 70 percent of the cost is represented by 5 to 10 percent of the population. And if you look at that 5 to 10 percent of the population, it is often the chronically ill. And if you look at the chronically ill, it’s often the poor. I look upon this as something that society should think of in a self-interested fashion: Help the poor so we can reduce health care costs overall. One way of looking at it is, “I need you to survive.” Think about the outbreak of the H1N1 swine flu that we had in 2009 or a global pandemic. All of a sudden we are very interested in each other’s health. Is this person healthy or not? Could they make me sick? If you look upon chronic diseases as an epidemic and you see that the chronically ill are the poor, then you see that this issue of the uninsured is not really a moral but a financial obligation to change health care. Do you think your life might have turned out differently if you had landed in Australia or Singapore instead of Los Angeles? Oh, definitely. I don’t think the entrepreneurial capacity and risk taking—the ability for people to really execute their dreams—exists anywhere else in the world, whether it’s China, Japan, Canada, South Africa, or Europe. That’s the beauty of this country. I think of L.A. as truly the melting pot. It’s basically a mini country unto itself. What about the philanthropic landscape of Los Angeles? Given the tremendous wealth that’s out here, do you think that people give enough? There is no right or wrong way of giving. People in Los Angeles have made major contributions in different ways to the city: Eli Broad to art. David Geffen to hospitals. I’m not judgmental. You pledged $100 million to help reopen Martin Luther King Jr. hospital in South L.A. Shut down in 2007 because of severe mismanagement, it’s a place that many others had given up on. Why did you want to get involved? Martin Luther King said that medical care is actually a human right and that the greatest insult to humanity is to not provide care to people who really need it. When Martin Luther King hospital was shut down, it just bothered me. I read in the newspaper that this Hispanic lady went to the hospital and ended up having to call 911 from the emergency room and later died. So I went down there afterward to talk to the doctor and walk the halls, and I said, “Show me, just show me what happened.” This was a little island that was ignored in our own community. Here there is wealth and knowledge and information, and nobody wanted to take this on. So I went to UCLA leadership and said we must help them. Working with [County Supervisor] Mark Ridley-Thomas, we took on this fight. We tried to shame institutions into helping. It emerged that there was this big financial risk that no one wanted to take. So I said, “I’ll take the risk.” Hopefully the hospital will open again soon. You also pledged $135 million to St. John’s Health Center in Santa Monica. Then in December, the two top executives and most of the board were suddenly tossed out for reasons that still aren’t clear. Do you normally stay engaged with a place after you’ve handed it money? We never give and walk away. We choose organizations to give to that we feel we can contribute to both financially and intellectually. And sometimes we value the time as much as the money. St. John’s is a perfect example. Here is an institution run by the Sisters of Charity of Leavenworth, whose passion is to give the highest and best-quality care to whichever patient walks through the door. It could be a celebrity or it could be a janitor—they’re not treated any differently. So I saw that and said, “This is a place for me.” This is a place where we can actually create a system to break up medical apartheid in this country and take the best of computer science, advanced cancer care, radiology, and the best of compassionate care and deliver it at a low cost. It was a tremendous shock to me that the board members were treated this way by the hospital systems board. I don’t think the nuns running this board really had any insight into what was going on with the hospital. Not every place can handle such a big check. What about the smaller outfits? There is this Sister Rosa and Father John at Resurrection Church in East L.A. They’ve been feeding more than 200 people a day for more than 20 years. We have given them walk-in refrigerators. We helped buy them a truck. What attracted you to that mission? It’s the way Sister Rosa and Father John provide dignity. The first time Sister Rosa met me, she took me to her truck, which had a burned-out engine. She said, “Are you a mechanic by any chance?” I said, “No, Sister, I’m not a mechanic, but I can help you get your truck fixed.” Then I saw they were baling cardboard to sell so they could buy gas. They were empowering themselves and the community. For example, they have T-shirts and clothing, but they don’t give it away. They sell it. For five cents. Because the person buying it feels empowered. There is dignity in the receipt of that. The community helps pack and serve the food. We stand in the food lines with them. It’s not a handout, it’s a hand-in. Do you feel any particular pressure to see results? Think about this: pancreatic cancer. A paper just got published by Stanford that showed that between 2001 and 2006 in California, if you had pancreatic cancer, 65 percent of the time you were getting the wrong treatment. So you have a patient who could have two months to live if they get the wrong treatment. Or they could be completely disease free five years later with the right treatment. And what if that person, by the grace of God, is empowered to know which is the right treatment? That’s the pressure on me. Lives are at stake. If you could recruit other wealthy folks in Los Angeles to contribute to a philanthropic endeavor, would you want them to donate to your health care projects? I think so. You know, when I was part of the Giving Pledge [the initiative promoted by Bill Gates and Warren Buffett for billionaires to give away a majority of their wealth], it was my vision, initially, that this could be a forum for people who might have like passions. Because not everyone is interested in cancer, not everyone is interested in the arts. For example, in art I would have no idea. But if you are interested in cancer, why not all join forces? Collective giving could have so much impact. So your goal is in part to go to your grave having given away all of your fortune? What we’re definitely committed to doing is to build a major foundation, the likes of the Gates Foundation, which has done fantastic things for the capacity of Africa. I want to do transformational work to actually fix the world. But to fix things in our own country first. We have pockets of the Third World in our own country. At the end of the day, I’m a physician. I’ve been blessed with ideas and resources to use technology to make the world a better place. That’s what I would like to leave behind.